Twelve-tone technique (also dodecaphony, and in British usage, twelve-note composition) is a method of musical composition devised by Arnold Schoenberg. The technique is a means of ensuring that all 12 notes of the chromatic scale are sounded as often as one another in a piece of music while preventing the emphasis of any through the use of tone rows, an ordering of the 12 pitches. All 12 notes are thus given more or less equal importance, and the music avoids being in a key. The technique was influential on composers in the mid-twentieth century. Schoenberg himself described the system as a "Method of Composing with Twelve Tones Which are Related Only with One Another". However, the common English usage is to describe the method as a form of serialism. Josef Matthias Hauer also developed a similar system using unordered hexachords, or tropes, at the same time and in the same country as Schoenberg but with no connection to Schoenberg's twelve-tone technique. 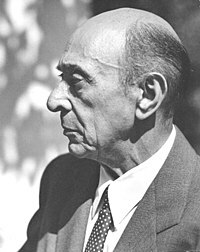 Other composers have created systematic use of the chromatic scale, but Schoenberg's method is considered to be historically and aesthetically most significant. Invented by Austrian composer Arnold Schoenberg in 1921 and first described privately to his associates in 1923, the method was used during the next twenty years almost exclusively by the composers of the Second Viennese School – Alban Berg, Anton Webern, Hanns Eisler and Schoenberg himself. while the "strict ordering" of the Second Viennese school, "was inevitably tempered by practical considerations: they worked on the basis of an interaction between ordered and unordered pitch collections." Charles Wuorinen claimed in a 1962 interview that while, "most of the Europeans say that they have 'gone beyond' and 'exhausted' the twelve-tone system," in America, "the twelve-tone system has been carefully studied and generalized into an edifice more impressive than any hitherto known." In 1971 legendary jazz pianist Bill Evans – who played on the landmark modal jazz album Kind Of Blue by Miles Davis – recorded a Grammy Award-winning album called The Bill Evans Album, which included a composition called "T.T.T. (Twelve Tone Tune)" where Evans and his trio explored the jazz implications of using the twelve tone compositional technique. More recently progressive metal guitarist Ron Jarzombek (Watchtower, Spastic Ink, Blotted Science) used the technique almost exclusivly on the track "Oscillation Cycles" off of Blotted Science's album "The Machinations of Dementia". Ron also released a DVD titled "12 Tone Variations" in which similar techniques are explained. The set is a specific ordering of all twelve notes of the semitonal scale. The set may be stated in any of its "linear aspects": prime, inversion, retrograde, and retrograde-inversion. The set in any of its four transformations may be started upon any degree of the semitonal scale. When twelve-tone technique is strictly applied, a piece consists of statements of certain permitted transformations of the prime series. Note that these statements may appear consecutively, simultaneously, or may overlap, giving rise to harmony. The tone row chosen as the basis of the piece is called the prime series (P). Untransposed, it is notated as P0. Given the twelve pitch classes of the chromatic scale, there are (12!) (factorial, i.e. 479,001,600) tone rows, although 469,015,680 of these are merely transformations of other rows. There are 9,985,920 truly unique twelve-tone rows. reversal in pitch, giving the inversion (I): I(χ) = P(12 -χ). However, there are only a few numbers by which one may multiply a row and still end up with twelve tones. Note that in the above example, as is typical, the retrograde inversion contains three points where the sequence of two pitches are identical to the prime row. Thus the generative power of even the most basic transformations is both unpredictable and inevitable. Motivic development can be driven by this internal consistency both positively and negatively. When rigorously applied, the technique demands that one statement of the tone row must be heard in full (otherwise known as aggregate completion) before another can begin. Adjacent notes in the row can be sounded at the same time, and the notes can appear in any octave, but the order of the notes in the tone row must be maintained. Durations, dynamics and other aspects of music other than the pitch can be freely chosen by the composer, and there are also no rules about which tone rows should be used at which time (beyond their all being derived from the prime series, as already explained). Derivation is transforming segments of the full chromatic, less than 12 pitch classes, to yield a complete set, most commonly using trichords, tetrachords, and hexachords. A derived set can be generated by choosing appropriate transformations of any trichord except 0,3,6, the diminished triad. A derived set can also be generated from any tetrachord that excludes the interval class 4, a major third, between any two elements. The opposite, partitioning, uses methods to create segments from sets, most often through registral difference. Invariance describes the portions of rows which have been so designed that they remain invariant under the allowable transformations (inversion, retrograde, retrograde-inversion, multiplication). George Perle describes their use as "pivots" or non-tonal ways of emphasizing certain pitches. Invariant rows are also combinatorial and derived. Also, some composers, including Stravinsky, have used cyclic permutation, or rotation, where the row is taken in order but using a different starting note. Stravinsky also preferred the inverse-retrograde, IR, to the retrograde-inverse, RI. Haimo, Ethan. 1990. Schoenberg's Serial Odyssey: The Evolution of his Twelve-Tone Method, 1914-1928. Oxford [England] : Clarendon Press; New York: Oxford University Press ISBN 0-19-3152-60-6. Hill, Richard S. 1936. "Schoenberg's Tone-Rows and the Tonal System of the Future". Oxford University Press. Neighbour, Oliver. 1955. "The Evolution of Twelve-Note Music". Proceedings of the Royal Musical Association, 81st Sess. (1954–1955): 49–61. Proceedings of the Royal Musical Association is currently published by Oxford University Press. Solomon, Larry. 1973. "New Symmetric Transformations", Perspectives of New Music 11, no. 2 (Spring-Summer): 257–64. Covach, John. 1996. "The Zwölftonspiel of Josef Matthias Hauer". Journal of Music Theory 36, no. 1 (Spring): 149–84. This article is licensed under the GNU Free Documentation License. It uses material from the Wikipedia article "Twelve-tone technique". Allthough most Wikipedia articles provide accurate information accuracy can not be guaranteed.